The start of Autumn for me always signifies wardrobe replenishment time. I think it stems from the start of term back in school when I used to overhaul my stationary with far too much excitement, and now, being at the London College of Fashion, I get the same joy (OK, way more joy) from overhauling my wardrobe. As soon as the leaves start to drop, so does my bank balance, because I have a serious weakness – Winter Booties. One pair simply isn’t enough when you consider that I will be wearing these Booties almost every day for the next six months. 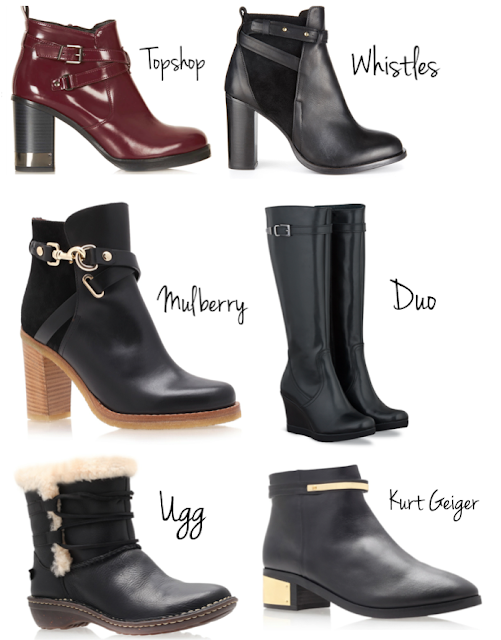 The elegant styles such as the Whistles and Topshop Booties look fantastic with thick black tights (nothing below 80 Denier) and a leather skirt or shorts, where as I’ll pair the Uggs or Mulberry Booties with skinny jeans. For serious comfort I’ll be reaching for my Duo Compton Boots – they are personalised to hug my calf so I’ll be super toasty on those chillly mornings. My Winter ‘running shoes’ will be the Kurt Geiger Vice Boots – I now find it impossible to walk in flat shoes, so the small block heel will add a little height but still flat enough to wear all day. I’ve already purchased 50 % off these boots (can you guess which?!) but I think I might have to have a major wardrobe clear out before I have room for the rest! Next Post Upcoming Sample Sales!